This Apostle was from Bethsaida of Galilee, and was the son of Zebedee and Salome, and the brother of James the elder. 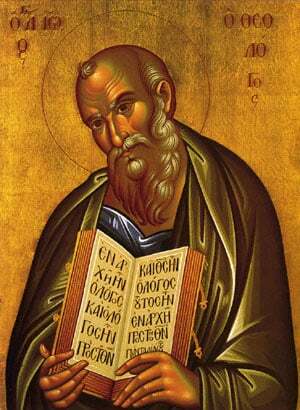 First a fisherman by trade, he became an Apostle and the beloved Disciple of Christ. Only he of all the Disciples followed Him even to the Cross, and was entrusted with the care of our Saviour's Mother, as it were another son to her, and a brother of Christ the Teacher. After this, he preached throughout Asia Minor, especially in Ephesus. When the second persecution against the Christians began in the year 96 during the reign of Domitian, he was taken in bonds to Rome, and there was cast into a vat filled to the brim with boiling oil. Coming forth therefrom unharmed, he was exiled to the island of Patmos, where he wrote the Book of Revelation. Returning again to Ephesus after the death of the tyrant, he wrote his Gospel (after the other Evangelists had already written theirs) and his three Catholic Epistles. In all, he lived ninety-five years and fell asleep in the Lord during the reign of Trajan in the year 100. He was called Theologian because he loftily expounded in his Gospel the theology of the inexpressible and eternal birth of the Son and Word of God the Father. It is for this cause that an eagle-a symbol of the Holy Spirit, as Saint Irenaeus says-is depicted in his icon, for this was one of the four symbolic living creatures that the Prophet Ezekiel saw (Ezek. 1:10). Share the feast of The Falling Asleep of St. John the Evangelist and Theologian with an icon greeting ecard.